This is a book of poems inspired by the work of William Blake (1757-1827). The premise is a peculiar gathering of guests at a hotel owned by William Blake. The guests include a boy, a tiger, a cat, a rabbit, and a man with a marmalade hat. The poems are accompanied by brilliant illustrations. How can I review such a book? I am not an adequate poetry critic. I know when I like a poem and I know when I don’t like one, but I can’t explain why. Some of the poems in this book reminded me of something Lewis Carroll would write, with plenty of talking animals and nonsense. I think you have to be in a certain mood to read these poems—a silly mood I guess. I loved the poem called “The Wise Cow Makes Way, Room, and Believe,” it was very clever and funny. And a character named Marmalade Man is always welcome. I just don’t know if this book warrants the Newbery Award. It was up against Beverly Cleary’s Ramona Quimby, Age 8, which is spectacular. But again, I don’t know enough about what makes great poetry. I only know how I feel when I read it, and I wasn’t necessarily blown away. One of the best things about this book is the illustration. Wow. It is so pretty and different from anything I’ve seen. It looks like something William Blake would have drawn himself, yet it’s entirely original. I loved how the drawings of William Blake had deep, thoughtful eyes, not cartoonish eyes like the other characters. 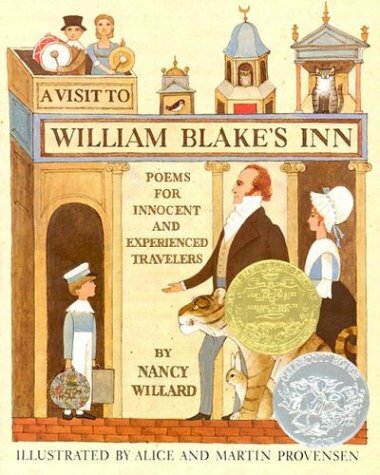 It showed a level of respect and admiration toward Blake that I think is lovingly reflected in the poetry itself. All in all, it is delightful to read, if not especially deep and moving. I would recommend this as a read-aloud book for families with children. However, I can picture my Aunt Mady reading this aloud to her cats and thoroughly enjoying it. Devotees of excellent illustration will love this as well. 3 boots – but I still say it’s only because I’m not exactly a poetry fiend.